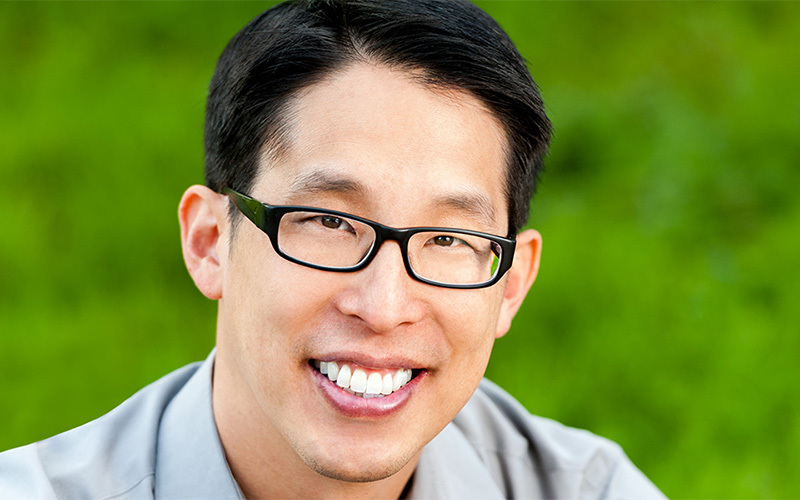 The Chubb Fellow for the Fall 2018 semester is Gene Luen Yang, the award-winning graphic novelist, cartoonist, and educator. Gene Luen Yang delivered the Chubb address at 4:30pm on Wednesday November 7th in the Yale University Art Gallery Auditorium. A private post-lecture reception with Yale dignitaries and special guests and a formal dinner with university students followed in Timothy Dwight College. We were deeply honored to have Gene Yang come to campus this fall. Born and raised in California, he began drawing comics in the fifth grade. Yang graduated from the University of California at Berkeley in 1995 majoring in computer science with a minor in creative writing. He also received an M.A. in education from California State University at East Bay in 2003. During this period, he began self-publishing his comics under his own imprint, Humble Comics, and also taught computer science and served as the director of information services at Bishop O’Dowd High School in Oakland, California. In 2006, Gene Yang published his path-breaking and prize-winning graphic novel, American-Born Chinese. Combining elements of American comics and Chinese folklore Yang explored Chinese American adolescence, identity, and cultural hybridity to illuminate the Chinese immigrant experience in the United States in the late 20th century. American Born Chinese became the first graphic novel to become a finalist for the National Book Award . It won the American Library Association’s Michael L. Printz Award for a book that “exemplifies literary excellence in young adult literature.” In the comic book world, the book won the 2007 Eisner Award for the best graphic album. His next major solo work, Boxers and Saints , published in 2011 chronicles the story of the 1900 Boxer Rebellion in China from two different protagonists and perspectives – a Chinese boy who joins the rebellion and a Chinese girl raised by Christian missionaries. Boxers and Saints was a finalist for the 2013 National Book Award and won the Los Angeles Times Book Prize in young adult literature. The book also received a nomination for the 2014 Eisner Award for the category of best publication for teens. In 2016, Gene Yang won the prestigious MacArthur Fellows Award for “bringing diverse people and cultures to children’s and young adult literature and confirming comics’ place as an important creative and imaginative force within literature, art, and education.” The Library of Congress appointed Gene Yang to serve as the fifth National Ambassador for Young People’s Literature from 2016 to 2017. During his term, he promoted the platform of “reading without walls” to break down barriers and work towards greater social inclusivity and diversity in children’s literature. Gene Yang has experimented with the superhero comic book genre to explore themes of race, inclusion, and social inequality. He has published The Shadow Hero (2014) to great acclaim and wrote for the New Super-Man serie s by DC Comics and Avatar: The Last Airbender for Dark Horse Comics . Yang has also published a series of graphic novels for young readers, Secret Coders that combines computer coding and logic puzzles with a mystery. He is currently at work on his non-fiction graphic novel, Dragon Hoops , that chronicles the story of the highly diverse six-person squad of the Bishop O’Dowd High School boys’ basketball team and their 2015 run for the California state championship. Since 2012, Yang has taught in Hamline University’s MFA program in Writing for Children and Young Adults since 2012. He lives with his family in San Jose, California. We are deeply honored to have such a distinguished leader and educator join the impressive list of Chubb Fellows who have visited Timothy Dwight College. Gene Yang’s lecture summarized his groundbreaking career as a graphic novelist, cartoonist, and educator was a enjoyed by many..